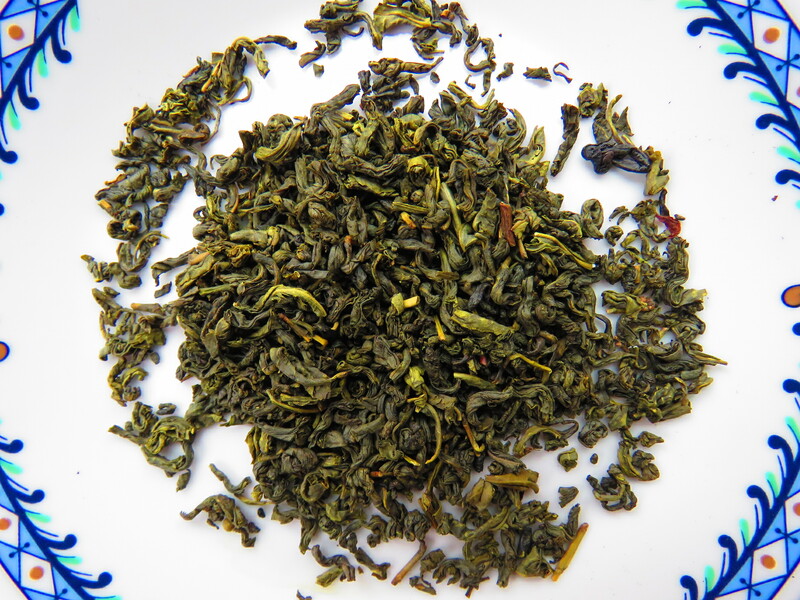 Tasting Notes: Exquisite, abundant Jasmine character on a seasonal green tea. This Jasmine flavour is only possible with midnight May flowers. This tea is a particularly good organic jasmine – hence the moniker Gold Dragon, (gold means wealth, prosperity, money and dragon means long life and strength). The jasmine tree comes into bloom only during May and June. The blossom only lasts for about 12 hours and only comes out at night after the sun goes down. About half way through the night the fragrance is at it’s peak and it is at this time the blossoms need to be picked and layer into the tea. By the morning most of the fragrance has disappeared from the blossom, but if the tea maker has done his job correctly, this heavenly scent has been transferred to the tea and captured in time. This process is carried out on 5 successive evenings to impart the superior flavour of specially selected tea and jasmine flowers. In China during the Sung Dynasty (960 to 1127) tea drinking rose to an art form. The harvesting of tea became closely regulated. Drum and cymbal signals were used to coordinate the tea pickers during chilly dark pre-dawn hours. The tea pickers (always young virgins) received special training and even wore identification labels on the clothing so that tea thieves could be readily identified if they entered the estates. The girls were required to keep fingernails at a precise length, since nails, never the finger, were used to pluck the highest quality tea leaves. The fresh picked leaves were graded into classes and processed. The choice grade was delivered as tribute tea for the Emperor, while the rest was traded and sold by the regional government. A handful of tea of the choicest grade could be worth as much as 3 ounces of gold – virtually a lifetime of earnings for the common man.